Ok, so your parent’s 25th anniversary is approaching, and you have decided to surprise them with a party where you are going to invite all the family members and their close friends. It would definitely be the biggest happiness that you can give to your parents in the whole world. But still, while you know you there are plenty of anniversary cards by Hallmark to choose from, you haven’t figured out what gift you are going to give your parents on their anniversary. Do not worry, we have got it all covered for you. Here we will give you some fantastic gift ideas that you can consider while buying gifts for your parents on their anniversary. The 25 years of blissful married life call for a toast. So, gift your parents a set of personalized champagne glasses and give them the reason to toast to the wonderful event of their life. The exclusively designed champagne glasses will make the celebrations all the more special for your parents. 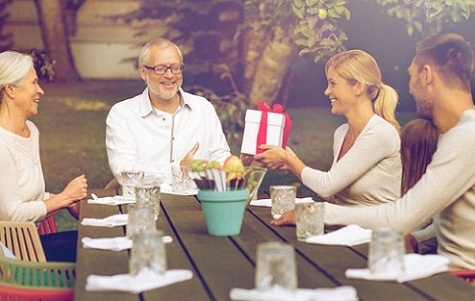 It is one of the best gifts for your mom and dad on their 25th anniversary. Parents spend their entire life to raise their kids and provide them with a comfortable life. Amidst all the responsibilities, they almost forget to live the life of their dreams. On the 25th anniversary of your parents give them the vacation tickets to an exotic location where they can unwind and have the time of their life. You can search a romantic destination on the Internet and book the trip tickets online. It is one of the best 25th anniversary gifts that you can give to your parents. The 25th anniversary is also called silver jubilee. Therefore, a silver photo frame as a 25th anniversary gift to your parents would be a memorable gift for them. You can put a beautiful picture of your parents from the early days of their married life in that photo frame. It will certainly bring back memories from the best days of their life. A personalized wall frame with all the important dates and events of life mentioned would make a perfect gift for your parent’s 25th anniversary. It will remind your parents of their wedding day, the moment they had their kids, the day they bought their first car and house. Every beautiful memory of life will start flashing in front of their eyes. And they will realize how happily they completed the 25 years of their life in each other’s company. So now you must have got some idea about choosing gifts for your parent’s anniversary. You can order the gifts mentioned above online in India for your parent’s anniversary. Whatever gift you choose for your parents make sure it conveys your heartfelt love to them.